What can I say, benches! We have been surrounded by strange curved pieces of steam bent and scorched oak, stacked on workbenches and in any other available space. 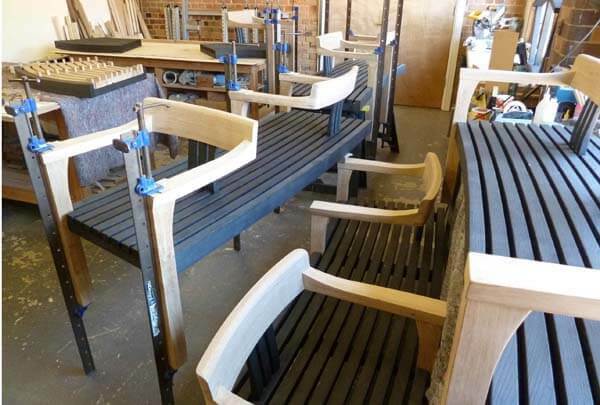 Needless to say this is the Tudor Arcade Seating commission taking its final shape. At around 10 metres long we have only seen 3 or 4 sections together at any one time, and it’s often a different 3 or 4 sections. There is a buzz around the workshop though, we all know it’s going to look rather special. Fitting will be on the 25th April onwards and we should have it in and complete before the following weekend. I can’t wait to stand back and people watch. Will the good people of Dorchester warm to it? Hopefully they will get the quirky nature of the seating arrangement and find their own favourite spots. No doubt they will use it in all sorts of ways I haven’t even considered. We are leaving our name on it – kind of a ‘big business card’ as a friend within Dorset County Council put it. 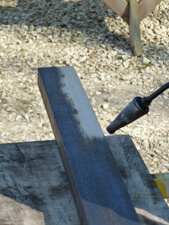 We have CNC cut our logo into the black scorched rail which looks terrific. My old friend Jason from Cameron and Talbot did it for us. I certainly was not expecting to look as good as it did. Once again it’s that lovely combination of ancient, earthy technique with something very digital and modern, a theme that has run through this commission. Mike has been plugging away on Tudor Arcade for over a month now and he’s either seen in a haze of steam or with a gas torch in his hand scorching oak. He is now most of his way through the 200 or so components to blacken. Just told him this week we probably have another two projects which will involve more scorching. To my surprise he didn’t seem to mind the idea of looking like a miner for a bit longer. One of these projects is a reception desk for a design agency who love the idea of a very black and white scorched and bleached ash. The other is a bit of a surprise that we hope to unveil during Dorset Art Weeks open studios (26th May till 10th June). On top of that John is also now making 2 new benches loosely based on the Tudor Arcade ideas for domestic use. I’ve not designed ‘garden furniture’ before, but had always intended to do so when the opportunity arose, and this was it. Again these two pieces will be on show during Arts Week, and yes, the slats and frames are scorched. Bit of a theme developing me thinks… At some point I will stop burning the hell out of everything we make, but right now just indulge me. I love that richness of the charcoal black and texture once the grain has been brushed, particularly when it contrasts with the natural timber. Of course John has been away for half of the month. He and Emily saw the safe arrival of baby Poppy on the 29th of February which makes her very special. 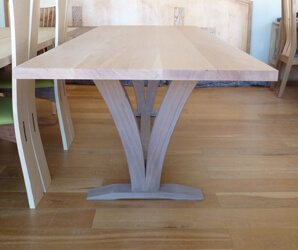 John had started a dining table in cherry and black walnut for the kitchen near Salisbury, and it has been that project he came back to. It will complete the kitchen and we hope to deliver it and do the cherry skirtings at the same time. Perhaps then we can finally get some professional images taken and ‘show it off’ a bit. Talking of images we also have had our first experience of being filmed. As part of our new PR strategy with Watershed PR we are having a number of films made. This first one focuses on the Tudor Arcade project and the very visual steaming and scorching techniques we are are utilising. It will be up on our own youtube channel soon – we will keep you posted. Really enjoyed the day with Jonathan and Stephen, although I don’t think John, Mike or I knew quite how intense a day we were in for. Looking at some of the images filmed I think we are going to have something really exceptional for you to watch, but we will have to see what magic the team from Watershed can weave. More from the workshop coal face next month!